Where is are your windows located? Are your windows in an area such as above the sink or above the stove where food, grease, water and more can easily come into contact with it? What function do you want your window treatment to serve? 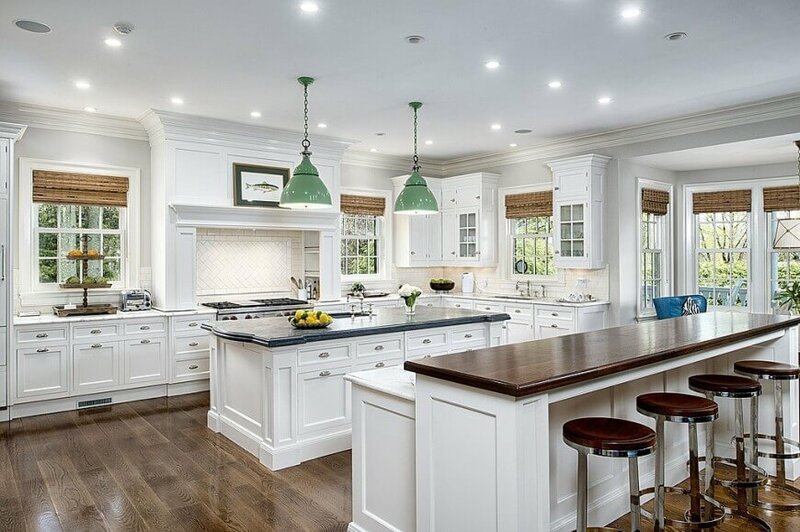 Here are the top 4 options for that kitchen that allow you to keep both beauty and function. Due to their moisture resistance and easy to clean surface, hybrid plantation shutters are the perfect choice for kitchen windows in high splash areas. This design also adds an upscale look to your kitchen, and functions as a mechanism to filter natural light and add privacy to your space. This classic design gives your window a timeless and polished look without taking away from the interior design of the kitchen. Made with PVC, not only does this offer a humidity resistant design, you can easily wipe them down with soap and water to remove any grease and grime. Woven shades bring texture and beauty to your kitchen windows. Although, just like fabric window treatments, this material may retain stains from food splatter and grease, the darker natural/neutral tones help them to be less visible and less of an eyesore in your beautiful kitchen. If your window treatments are in what’s considered a “Splash Zone”, It is best to deter from fabric window treatments. However, if fabric solutions such as roller shades, roman shades, and more are a beauty you do not want to sacrifice, motorization may be the best option for you. Motorized window treatments allow you to adjust your shades via remote, wall switch or smartphone. You can do this before, during, or after cooking or washing dishes, which can help food splatter, grease stains, water splashes from soiling the fabric. This also lowers the wear and tear on your window coverings as you do not have to manually adjust you do not need to manually adjust your shades. Ready to upgrade your kitchen with fabulous and functional window treatments? Contact us today for your FREE in-home consultation.